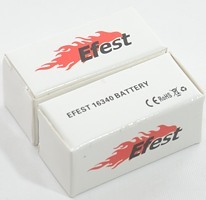 This battery is a short 16340 battery, making it easier to fit instead of a CR123 battery. 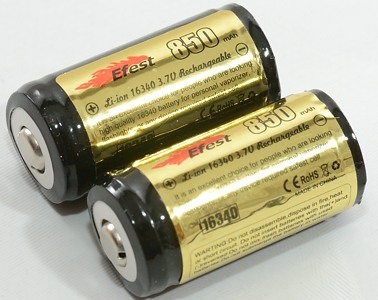 The capacity is considerable lower than specified as is usual the case with 16340 batteries. Internal resistance is calculated between 1A and 2A. 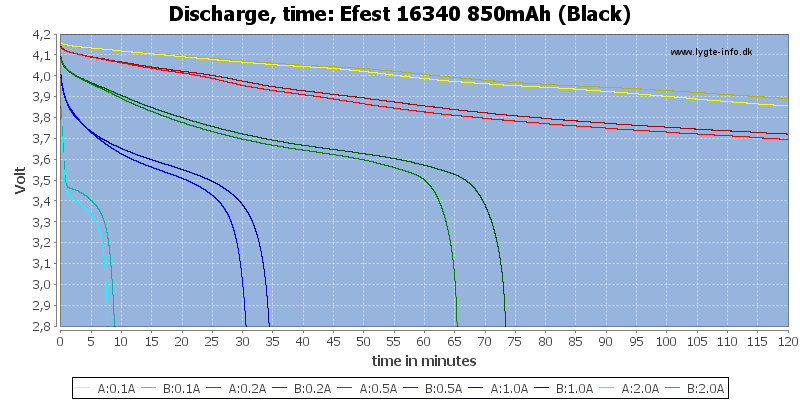 There is a large difference in performance between the two batteries, this is not good for use in series. 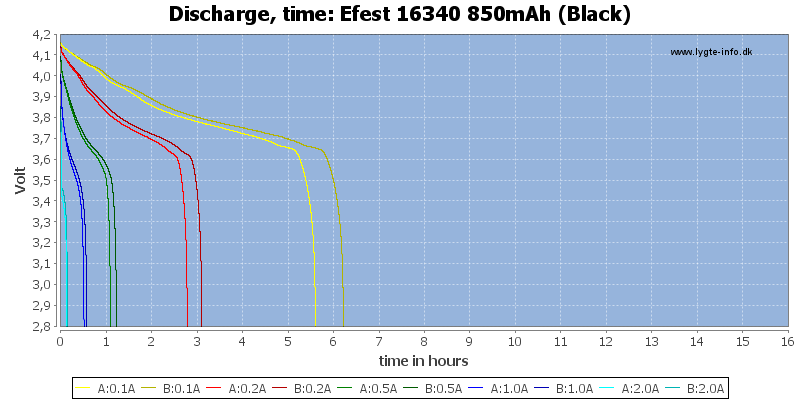 Their upper current limit is also rather low, the performance at 2A is not very good. 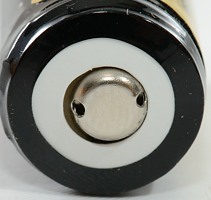 The two batteries does not have the same protection threshold , one is at 2.9A, the other at 5A. I am not very impressed with these batteries. They can be used on at a time, but with the differance in capacity, they are not very good for use in series. And is 1/4 ohm like the table says? The curves may show different values for this but I can’t make out the color legend. Yes, the DC resistance is 0.25 ohm. The curves may show different values for this but I can't make out the color legend. Next time I generate curves the legend will use thicker lines. 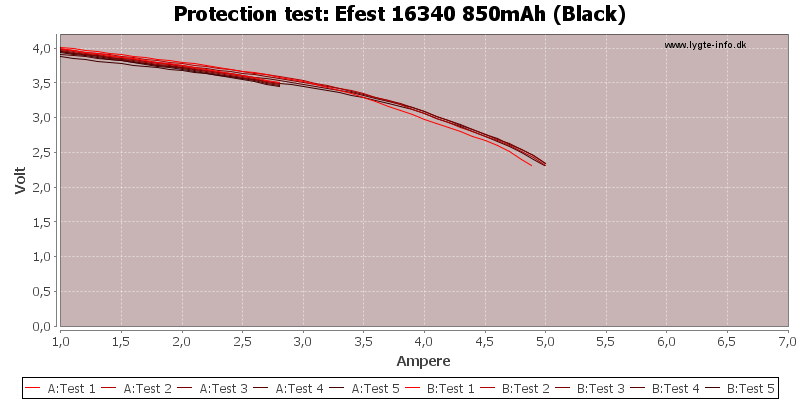 The internal resistance is calculated from the "Protection Test" curve and you will not get much help in reading that from thicker legend lines. 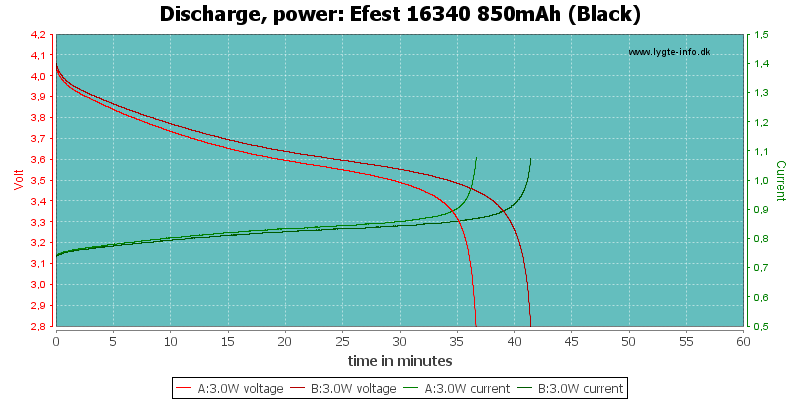 With that curve I get (4-3.5)v/(3-1)A = 0.25 ohm or (4-2.3)v/(5-1)A = 0.43 ohm, avg. 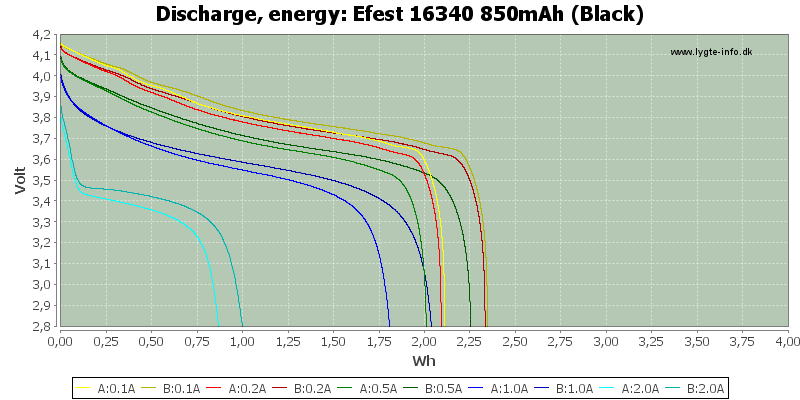 Seems like nothing with cells gives a straight line and coming up with a formula for even a single discharge curve would be pretty difficult. Back to the piece-wise linear approach. And… this review shows that they are better than AW at 2A Well, they are better in general. 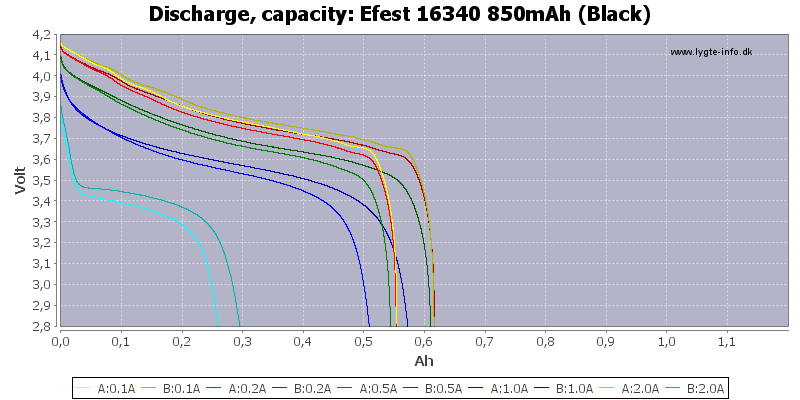 That is the reason I calculate it between 1A and 2A, when you put a heavy load on a cell the curve will not be linear and you will get to high a value (Except if you plan to use the battery at high currents). Thanks HKJ. 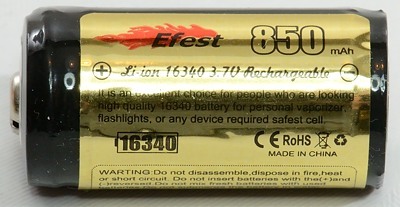 We need a 3000 mAh capable of 3.5 amp discharge in this size package. Next year maybe. Cheers. 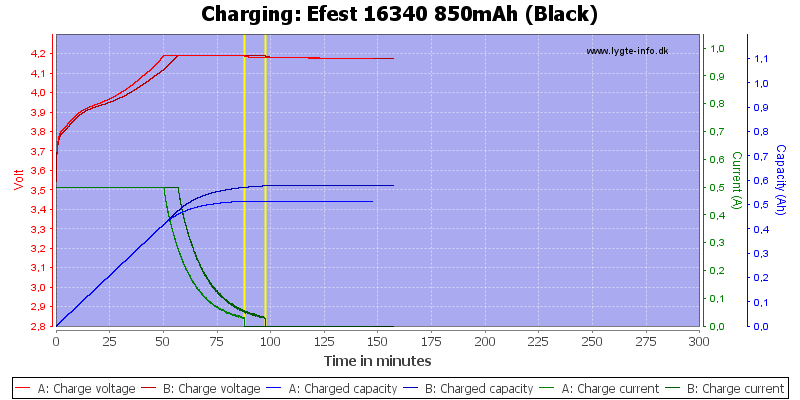 Thanks for another usefull test, I'll stick to my Nitecore 16340 then. where can you buy these :)? 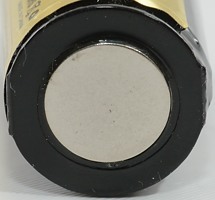 is this a 16340 http://www.fasttech.com/products/0/10001848/1134001-nitecore-nl166-rcr12... ?